Javier Castellano will replace Corey Nakatani aboard Bolt d’Oro (Medaglia d’Oro) when the multiple Grade I winner makes his sophomore debut in the Mar. 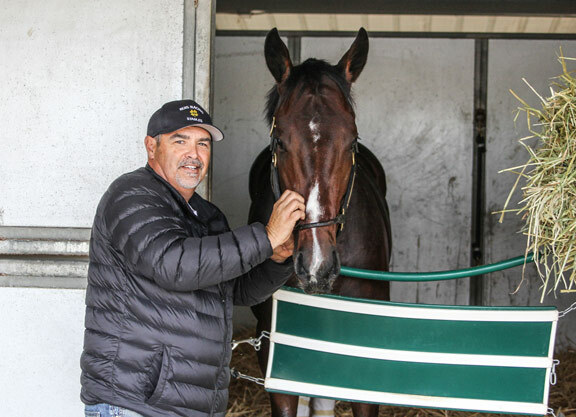 10 GII San Felipe S. Nakatani was aboard for all four of Bolt d’Oro’s previous career starts, including wins in the GI Del Mar Futurity and GI FrontRunner S. He was third after a troubled start and a wide trip in the Nov. 4 GI Breeders’ Cup Juvenile. Nakatani was aboard Saturday when Bolt d’Oro had his first work since the Breeders’ Cup, going three furlongs in :36.80. Away from racing for nearly a decade before reemerging as a major force in the game two years ago, Ruis recently purchased the 169-acre Chestnut Farm in Lexington. The property was previously owned by Michael House. “I bought it sight unseen,” Ruis said of the purchase.